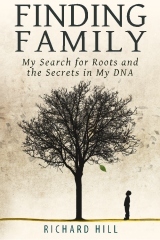 "Review: Finding Family: My Search for Roots and the Secrets in My DNA," Deb's Delvings Blog, posted 29 August 2012 (http://debsdelvings.blogspot.com/2012/08/review-finding-family-my-search-for.html). "Free Preview: Richard Hill's Finding Family," Deb's Delvings Blog, posted 11 February 2016 (http://debsdelvings.blogspot.com/2016/02/free-preview-richard-hills-finding.html). Debbie Parker Wayne, "Audio Version: Richard Hill's Finding Family," Deb's Delvings Blog, posted 28 February 2017 (http://debsdelvings.blogspot.com/ : accessed [date]). You have a lovely blog. I just began doing a family search on the web and have been amazed, fascinated although sometimes frustrated, but I am enjoying the process. I live in Montreal, Canada, and my parents were also born here, but my grandparents on my father's side are from England. Interestingly, in some cases I have had an easier time getting family information via England than here in Montreal. Thank you so much for sharing. Thank you, Linda. I hope it gets easier for us to find records in all of the locales where we work to find our ancestors. Good luck with your research.